Over the coming 4 months we want to take you on our journey as we create a new dementia resource centre in the Heart of Helensburgh. In 2010 Helensburgh Services opened one of Alzheimer Scotland’s first DRC’s with the support of Helensburgh & District Branch and a group of very enthusiastic volunteers. This was a brave step in taking dementia into the high street, however very quickly we realised the community of Helensburgh was right behind us with our volunteer team growing from 10 to 25 in the first 6 months. Over the past 5 years we very quickly outgrew our current premises, often having to hire venues that were not always suitable for the events & groups we wanted to host. Our dementia advisor often had to meet with people with dementia & families in coffee shops and our staff found themselves having meetings in the kitchen as the office was too busy. Premises have been a challenge to source and we have had our hopes dashed a number of times over the past couple of years. We needed to find somewhere that was central, that had space we could use flexibly for a variety of activities while being a welcoming environment for people looking for information, advice and support. The space also needed to be fit for a growing staff team and that could accommodate a Community Outreach Service. We now need to grow out volunteer group to allow us to have the DRC operational as often as possible and offering a variety of opportunities for people living with dementia and their families. We also need to raise £100,000 – that will enable us to create a DRC that is fit for the future and that the community of Helensburgh is proud of. Please take a moment to support the build of our new DRC by donating to our JustGiving page here. To get involved, fundraise or follow our progress email me at jarmitage@alzscot.org or visit our local facebook page. 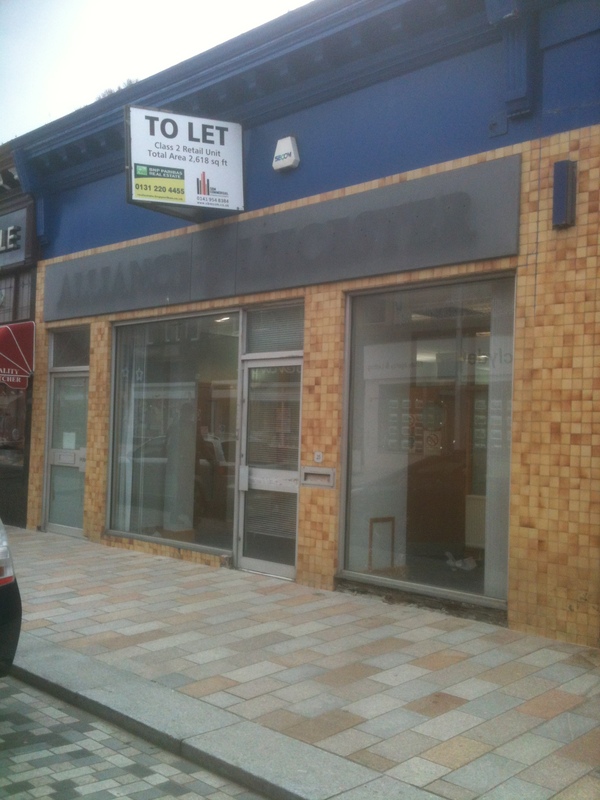 …next month we will show you what we found and how work is progressing…right in the Heart of Helensburgh! My remit as a Policy and Engagement Manager with Alzheimer Scotland is interesting and varied with four main areas of work – Membership engagement, Representation and policy, Fundraising and Supporting & working with Branches. For me it is about ensuring people’s views and experiences inform policy makers’ decisions, that voices are listened to at both local and national level and that people are enabled to get involved in the way that suits them. Let’s keep talking about dementia: at home, at work, in the street and on the bus, in cities, towns and villages across Scotland and beyond. Next week’s blog post will invite you to comment on how we can make this blog post useful to you if you are living with dementia or are a carer, family member or partner. My fourth and final Occupational Therapy placement at Alzheimer Scotland was daunting and exciting all at the same time. Research discusses non-traditional or role-emerging placements however as far as I was concerned terminology was immaterial, this was not NHS and was outside my comfort zone. Emails and final arrangements were confirmed and I was sent a timetable for the 8 weeks of my placement. Some may have been overwhelmed with the multiple pretty coloured schedule however my preference for organisation was loving this! My Practice Educator within Alzheimer Scotland was obviously going to be my kind of person, organised and clear. My personal focus initially involved attempting to identify the core skills of Occupational Therapy and potential for occupation based approaches in a non-traditional AHP student placement. A presentation to staff within the office provided an opportunity to articulate and demonstrate the core skills of occupational therapy through a group activity to complete an occupational analysis, with the obvious inclusion of cake to promote further engagement for a student presentation. During the 8 week placement I attended dementia cafés, a choir, carers groups, assisted at information events and utilised meaningful occupations to encourage engagement and potential strategies to support independence with people living with dementia. Every day my children would ask questions about me going to cafés and singing in a choir, so not only was I relating and discussing occupational therapy theory on placement, I was returning home and justifying the occupational perspective to my kids – the joys of being a mature student. Events and groups are all facilitated by Alzheimer Scotland to provide advice whilst supporting people living with dementia, their families and carers. Dementia cafés, I thought, “great, sounds like a relaxing cup of tea and a blether”. I was so wrong, these cafes are so so much more for those who attend. During every café I met fantastic people willing to share stories and experiences, ranging from daily challenges faced, to support independence, to favourite holiday locations and what was happening on Emmerdale. Those attending received peer support and advice from the attending Dementia Advisors. Attending the cafés evoked a discussion with my Practice Educator regarding ‘being’ and ‘doing’. On reflection, a key moment during my placement and during my studies was realising my passion for my new career as an occupational therapist, the potential to initiate the occupational therapy process in unconventional environments whilst identifying meaningful occupations and challenges. Choir, another fantastic opportunity to observe the great groups facilitated by Alzheimer Scotland. However, participation was involved, a huge accomplishment to the Dementia Advisor considering I am the person who only sings alone in the car. The choir demonstrated the benefits of social engagement through music, for some a new experience and for others a love they have participated in for many years. Occupational Therapy has huge potential to enhance the services, support and advice provided by Alzheimer Scotland. What can an occupational therapy/AHP student learn when they are on placement in a third sector organisation? If you are a third sector organisation, what benefits could an occupational therapy/AHP student offer your organisation whilst on placement. This is my final year at Queen Margaret University, Edinburgh, already consolidating my passion for a uniquely influential profession with an ability to influence people’s lives. I would like to take this opportunity to thank everyone involved in the organisation of my placement but there are individuals who have been particularly influential in the experience and will not be forgotten. After World Alzheimer Day on the 22nd September, we hosted a one day conversation celebrating the best in Supported Self-Management for people with dementia and co-creating the future direction. In this week’s blog we will share with you what we did that day, including a launch of a publication, live stream presentations, posters, structuring the day around appreciative inquiry and interviewed delegates. During the day we kept talking about dementia and we hope you enjoy some of the resources we have developed as a result of the day. Our first speaker for the day was Jacqui Lunday Johnston launched our second publication “Allied Health Professionals Delivering Post-Diagnostic Support: Living Well with Dementia”. Click here to access a copy of the publication. When supported self -management really works, what kinds of things happen for you and the person with dementia? What would you put in place around supported self-management if you Knew success was guaranteed? From reviewing all the resources we have shared in this blog, what has been the most relevant for you? We would love to hear your views.